The Creative Learning Guild now based at Causey Hall want a society in which diverse, innovative, creative education is the status quo. CLG believes the best way to achieve this is by inspiring, connecting and championing allies who also share these values. The space at Causey Hall has been renovated into a completely accessible, state of the art learning space including a large hall, meeting room, breakout space and our offices. 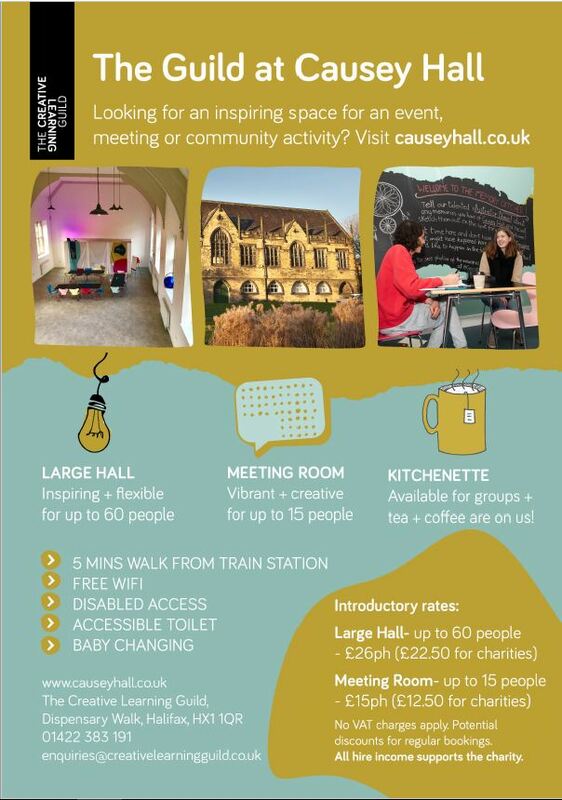 The Guild at Causey Hall, Dispensary Walk, Halifax, HX1 1QR, is now available to hire by community groups and businesses. For images of the architects’ plans and renovations work keep an eye on our image gallery and for more information about the type of facilities we’ll be able to offer see the drop downs below. If you have a group or event that would benefit from meeting and working in a creative environment please call Gabs Naddeo on 01422 383191 or email gabs@creativelearningguild.co.uk / enquiries@creativelearningguild.co.uk. They will be happy to explore with you how our space could meet your needs. This entry was posted in Get Involved / Have Your Say and tagged Causey Hall, Creative Learning Guild.